Moxibustion is a type of heat therapy where pieces of dried plant are burned on or near specific points on the skin. Moxibustion literally means “burning (bustion) of mugwart (moxa)”. Mugwart (Artemesia Vulgaris) is a common herb that grows throughout the world and has been used for medicinal purposes for centuries in a number of countries. In Oriental Medicine, moxibustion is a very important technique and commonly used along with acupuncture. You will often see the word ‘acupuncture’ together with ‘moxibustion’ in the same word, such as “acupuncture-moxibustion” or “acu-moxa”. Why use moxa? Can’t you use any type of combustible material such as a piece of wood stick or even a hot pack? Moxa is selected for therapeutic purposes because heat from dried moxa penetrates deeper into the skin while providing comfortable, gentle heat to the skin. Heating a small area with moxa, compared to a hot pack which warms wider area, is necessary to promote circulation along the channels since it creates temperature change on different parts of the skin which, in turn, generates a flow. Marked increase in white blood cell count has been observed in the area where moxibustion is applied. There are a number of ways moxa can be used. In indirect moxibustion, you light a piece of moxa stick and hold it close to the acupuncture points without actually touching the skin. The practitioner may slowly move the stick around the acupuncture points to allow the heat to penetrate into the points. In direct moxibustion, you put a small piece of moxa on acupuncture points and burn it directly on the skin. Since this technique may cause small burns, it’s used only in severe illnesses. Sometimes, the practitioner may put the moxa on a piece of ginger, garlic, salt or some other herbs depending on the condition. This enhances the therapeutic effect for specific conditions. In warming needle technique, you burn a small section of moxa stick stuck to the end of an acupuncture needle. This method allows the heat to penetrate deeper into the acupuncture points along the needle. Moxibustion is used for a number of conditions. First and foremost, moxibustion is used to relieve the symptoms caused by low energy and poor circulation. Many patients report that they feel deep, gentle heat that enable deep relaxation not achievable with other superficial heating method. Moxibustion is particularly effective for “cold dampness type pattern” causing joint ache and pain such as arthritis. Most joint pain gets worse under humid or cold weather. Because of the warm nature of moxibustion therapy, moxibustion is considered to tonify one’s yang energy and helps such conditions as low energy, chronic fatigue syndrome, cold hands and feet and spontaneous sweating. Moxibustion is also successfully used for many gynecological conditions and to correct the position of the fetus in breech condition. Moxibustion has been used to prevent against cold and flu just like a flu shot, except it works regardless of the virus strain since it enhances one’s immunity. 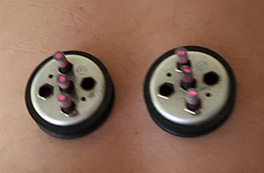 We often use moxibustion along with acupuncture to invigorate patients with low energy and to improve the circulation. Call us to find out if moxibustion would work for your condition.